Heiligman, Deborah. 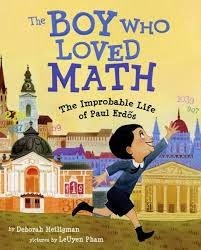 The Boy Who Loved Math; The Improbable Life of Paul Erdos. Ilus. LeUyen Pham. New York: Roaring Brook Press, 2013. 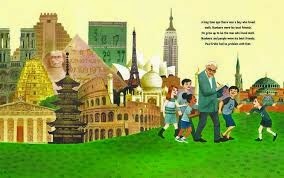 This is a picture book biography of a mathematical genius who did not remain huddled in his room working with math , but traveled the world, sharing his ideas and solving many difficult, previously unsolved math problems in group situations and encouraging other mathematicians to work together. Heiligman pulls the reader (even math haters) into this book by beginning with simple numbers – Paul’s age (4) when he could calculate how many seconds a person had been alive. By the time Paul turned 10, the reader can’t wait to find out about Prime Numbers along with Paul. Heiligman compares how his mother took care of young Paul to the way the adult Paul assumed everyone else would also take care of him as he traveled from mathematician to mathematician making very long visits. Amazingly enough all were honored to take care of this genius.